Once, when I was in law school, I was talking on the phone to a woman in my class who was looking for a study partner in a particular class that I was in. It was nearing finals and she felt like she needed some help. “Sure!” I said, because I’m darned helpful. And then she said, “The only thing is, we can’t study at my house because it’s covered in dog sh*t because I haven’t had time to take my dog out I’ve been so busy studying and I haven’t slept for two days.” We did not end up studying together. I tell this story for two reasons: 1) because it’s funny in a sad way, and 2) to illustrate a tendency that law students have toward mismanagement of basic living skills. Right now is a good time for you to vow to yourself never to end up in a situation where your house is covered in crap and you haven’t slept in two days. The former portion of the vow sort of speaks for itself, and as for the latter…. In law, as in any demanding field, you’ll often hear people lionize the Spartan sleep schedules of people like Einstein and Da Vinci, and you’ll hear talk of geniuses who need only three hours sleep. It’s bunkum. Ignore it. First, I want you to know that this is all absolute rubbish. There’s literally no reason to believe any of the stories you hear about people who sleep very little, because almost none of those stories are documented. And even if these stories are true, the idiosyncratic practices of one or two people don’t mean squat. Trust me on this: You need sleep, probably a little more than you’re getting, and almost certainly of a higher quality than you are getting. Why? Because sleep makes your body healthier, and because sleep improves your memory and cognitive function. The first step most law students should take toward getting more sleep is incorporating sleep as a priority in your schedule. Consider sleep a part of your study schedule. Set a bed time that you feel is healthy and right for you and stick to it; make sure you are scheduling a minimum of 7 hours a night. Eight hours is even better. There will be nights that you can’t make it to bed on time because of assignment or, ahem, social activities, and that is fine. That is nothing to stress about. Just try to make up what sleep you’ve missed, and make it up over the course of a few nights rather than in one long binge sleep session. Listen, law school is important, but what are really important are you and your experience with law school. So make sure to take ownership of the experience in a way that allows you to practice healthy habits. Yes, you need to study, but you also need to exercise, to eat well, and to sleep! If you want to hear more about the importance of self-care in law school, listen to this great podcast with Lee and Alison. I’m going to be honest with you: I hate the term “sleep hygiene.” It sounds to me like a phrase that someone made up in order to help sell self-help books. But I’m just one man against the world and the world has spoken, so I must accept it. I guess. Begrudgingly. 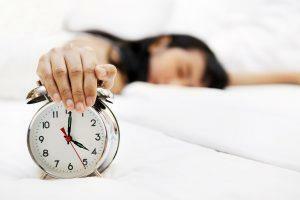 If you haven’t already learned about sleep hygiene, do so. It means having restful, healthful sleep practices. Many of these are common sense. Avoid caffeine and nicotine before bed. (Avoid nicotine all the time.) Avoid heavy foods that might disrupt sleep before bed. For most people, it’s good to avoid exercise in the hour before bed. And make sure that you have a designated sleeping space that is restful and as free from distractions as possible. And for most people, it’s best to avoid naps during the day. YMMV on that one. But if you do nothing else, at least make sure you have a restful place to slumber. Lastly, and this one is close to my heart, turn off your television at least 15 minutes before bed. Turn off all of your screens at least 15 minutes before bed. Don’t even bring your cell phone, tablet, or laptop into your bedroom if you can avoid it. If, like me, you use your iPhone as an alarm clock, then use the Screen Time app to turn off most of your phone’s functionality during sleep hours. I bring my phone into the bedroom, but now that Screen Time limits all the apps on my phone it’s pretty much impossible for me to use it as anything other than a phone or an alarm clock. And I sleep a heck of a lot better! Tyler Coulson is a lawyer, writer, and adventurer based in Chicago. In 2011, he left his position practicing corporate bankruptcy at a leading international law firm to walk across America with his dog, Mabel. His departure from biglaw and his transcontinental hike have been featured in the New York Times, the Chicago Daily Law Bulletin, and on Grantland.com. Since completing his 3200 mile hike, Coulson has written and spoken about his experiences both on the road and in corporate law. Coulson graduated with distinction from the University of Iowa College of Law.